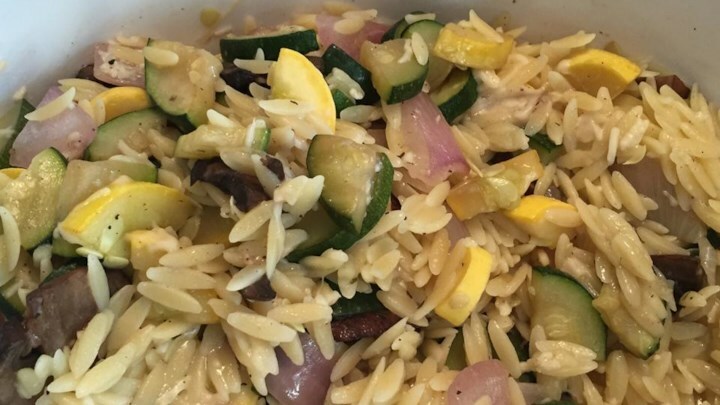 Found a recipe for the Orzo dish that is often served at work events in my office. This is the closest one I’ve found so far. I’ve included the entire recipe, even though whenever I get around to making it, I’ll probably leave out the onions, asparagus and parmesan. Place the zucchini, squash, onion, asparagus, and mushrooms in a large bowl; add in garlic, olive oil and sugar, and stir gently to coat vegetables. Spread vegetables in a single layer on a baking sheet, and sprinkle with salt and pepper. Roast vegetables until tender, 20 to 25 minutes. Meanwhile, bring a large pot of lightly salted water to boil. Add bouillon cubes, wine, and orzo, and cook until al dente, about 8 to 10 minutes. Drain. Stir in roasted vegetables and Parmesan cheese, and serve warm.